Maserati backed by mag+ platform sets a perfect example of how the automobile industry can make the best use of digital publishing practices. Maserati iPad apps are a source of design inspiration and delight to watch. 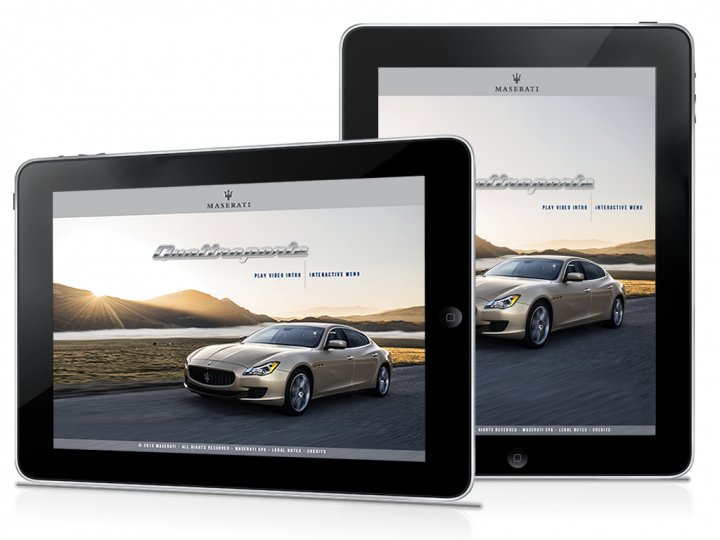 Beautifully showcasing their e-brochure as an iPad app, Maserati assists its consumers in exploring the exclusive world of interactive catalogs on their own devices. Designed neatly, the app gives clients and fans the opportunity to have an up-close look at the Quattroporte range and then brand-new Ghibli range. The interactivity is boosted with stunning video galleries, high quality graphics and dynamic layouts. Moreover, behind-the-scenes stories or detailed feature explanations enthrall users, let them feel the excitement, and stay connected with the brand. With satisfied and happy customers, Maserati has bagged one more accolade as the “Gold Winner” at the World Luxury Awards held in Monte Carlo. Designed with mag+ by Arachno, the app presents a stylish portrait of Maserati’s cars—we’re not surprised it won. Car Configurator: It helps users to view the desired car model in all available colors and wheel rims according to their tastes or preferences. Transforming a static model with desired features helps in setting a preview of unique style and assists in making quick decisions. Interactive Menu: Attractive full-screen images are combined with a soft browsing experience with fade and transparency effects, created with elegance. Dealer Locator: Users can directly access the interactive locator of the maserati.com site all because of Web view feature of mag+. This search is automatically parameterized as per the chosen language for the app. This app also includes the possibility of creating an interactive CONTACT, thanks to seamless integration with Maserati’s registration. In addition to Maserati, mag+ has assisted many other customers in the automotive space to seize the opportunity in digital space and develop apps to serve branded content to their customers and prospects. And why shouldn’t they? Getting on the same page with buyers is the first step to getting them in the door (or in the driver’s seat, in this case).